In today’s higher education there is traditional education, then there is experiential learning. Southern Utah University experts recently hosted experiential education leaders from several universities to share ideas on helping students through hands-on learning. 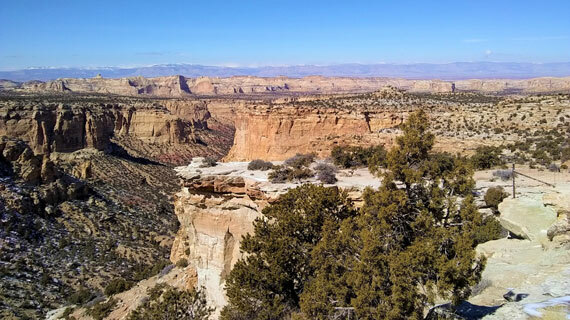 The Experiential Learning Leadership Institute (ELLI) at SUU held their first Leader’s Retreat in February with 40 educators from nine institutions meeting among the scenic landscapes surrounding Moab. Founded in 2015, ELLI has held three national conferences for experiential education leaders, with their fourth annual conference coming in June. But the Moab leadership retreat was different, Clarke said. Representatives from New York, Florida, Tennessee, Texas, Idaho and Utah, came to the ELLI retreat with an idea they wanted to implement and left Moab with deliverable plans they could take to their supervisors. As the Director of Applied Learning at State University of New York, the largest comprehensive system of higher education in the nation with 64 campuses, Elise Newkirk-Kotifa said she was honored to be invited and mentor those working to establish or improve experiential education in their institutions. Stephanie Thomason, Associate Director of the TECO Energy Center for Leadership at Tampa University, said her university’s mission centers on experiential learning and is continually looking for ways to enhance teaching effectiveness. The University of Tennessee at Martin sent a representative from four of their five colleges to the ELLI retreat. Charles Bradshaw, an associate professor of English, said UTM is working on a campus-wide initiative where every student engages in experiential learning before graduating. “The SUU staff at the Moab ELLI retreat were top-notch. I’ve been to other conferences that just scratch the surface of what is possible with learning objectives and assessment, but this one was really well done," he said. "It was just what we needed — a really great couple of days with some really sharp and pragmatic people." Clarke and many of the experts at ELLI conferences and retreats are members of the National Society for Experiential Education, founded in 1971. Last year, SUU was honored with becoming the permanent home for the archives of the NSEE that had previously been stored at multiple sites around the country. In 2015, SUU received the NSEE Outstanding Experiential Education Program Award for exceptional commitment to experiential learning. Proposals and registrations are now being accepted for the 2018 ELLI Annual Conference taking place June 25-28 in Flagstaff, with an experiential excursion to the overwhelming colors and erosional forms that make up the Grand Canyon. For more information, visit suu.edu/siel/elli, email elli@suu.edu, or reach SUU ELLI by phone at (435) 586-7808.